This post presumes you’ve seen Doctor Who up to and including “The Lodger”, which is episode 11 of the current season. Since I know this episode hasn’t aired everywhere yet, I’m going to put it behind a cut tag. I’m also going to distract you with a picture of a kitten. 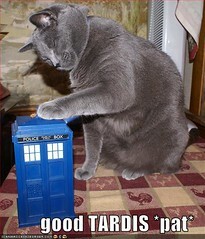 A large grey cat pats the top of a TARDIS toy. The caption reads Good TARDIS *pat*. Davros, Daleks, and Disability, by Guest Poster CapriUni. Doctor Who and the Evil Wheelchair Users of Evil, by Chally. I don’t mind telling you that I’ve spent a lot of time watching the new series and cringing, waiting for something to go terribly, horribly wrong. We’ve had two characters show up on the screen with a disability, and neither of them have been evil or horrible, and neither has died valiantly so that more worthy folks can live. It’s been kinda awesome. Doctor Who is, of course, a kids’ show. I don’t say that to sound disparaging – I plan my whole week around my Doctor Who viewing and discussion time, so I do think it’s for adults and kids, but the original mandate of the show was for kids to watch it and get more interested in history and the like. The Doctor really is supposed to teach us something, which is a small part of why the constant “Disability = scary” message has distressed me.[1. Torchwood, of course, is not a kids’ show. The only way to make Torchwood a kids’ show would be to cut every scene that isn’t swooping shots of Cardiff.] It’s not that I just think the show has a responsibility – the show does have one, explicitly mandated by the BBC. This is why I think the two explicitly disabled characters that have shown up in the new series are very important. One, Elliot, is a kid – a normal kid, who does normal kid things, and then gets kidnapped by “monsters”. He also has dyslexia – not exactly uncommon in both kids and adults. The other character, Vincent van Gogh, is deeply depressed – perhaps even having manic depression. Elliot’s story is in the two-parter “The Hungry Earth” and “Cold Blood“. We’re first introduced to Elliot when his father is reading to him, trying to get Elliot to start reading himself. Elliot refuses, and it’s soon clear that Elliot has dyslexia. I admit, at that reveal, I started tensing up. The last fictional media representation of dyslexia I had heard of was in Percy Jackson and the Olympians, where having dyslexia is because of one’s special nature and not just because some people have dyslexia. Elliot, for once, just has dyslexia. He wasn’t some hidden secret agent from the “monsters” who had dyslexia because his brain was wired to “monster”. It wasn’t so that the Doctor could learn a Very Special Lesson About Dyslexia. It wasn’t because of anything. Elliot has dyslexia because Elliot has dyslexia. In the second part of the serial, we find Elliot has been put in stasis by the “monsters” in order to study him. “Ack,” I thought. “They’re going to cure him, aren’t they? Oh, child, you are flawed by your human standards, let us give you what you most want in the world!” Certainly that is not an uncommon storyline. But again, Doctor Who both surprised and delighted me by not going there. Instead, there’s no indication that Elliot is changed at all by his experience…. Well, no more than anyone else would be changed by being dragged beneath the Earth’s surface by a reptile-like species. There is no magical cure. And having dyslexia does not prevent one from going on adventures. It just is. I can’t tell you how much that pleased me. The second explicitly disabled character is Vincent van Gogh. Vincent’s story is a lot more complicated that Elliot’s, being the main focus of the episode “Vincent and the Doctor” In this episode, the Doctor and his companion, Amy, arrive near the end of Vincent’s life, investigating a strange thing in one of Vincent’s painting. They arrive to find the “greatest painter of them all” disliked and reviled by his community, unable to sell a single painting. They immediately befriend him, the Doctor determined to find the “monster” that was hidden in one of Vincent’s paintings, and Amy determined to help the painter she worships sort out his life. This episode does a lot of interesting things. Vincent is besieged by an invisible monster that only he can see, that’s killing people in the village and making him even more reviled and hated because people blame “the crazy man” for the killings. 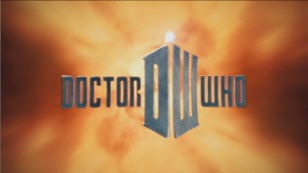 Even the Doctor cannot see the monster without a magical do-hickey, and he needs Vincent’s help in order to defeat it. Ultimately, the person who slays the invisible monster is Vincent himself. As a metaphor for depression and other mental health conditions, an invisible monster that no one else can see to help you fight, and one that makes other people distrustful of you because they can’t see the monster, only what it does, is a pretty good one. I admit to having been a bit uncomfortable with it at first – oh, I see, a monster that only the crazy person can see. How stereotypical. And yet, the episode didn’t really go in that direction. The monster was real, it was serious, and the Doctor couldn’t defeat it – only Vincent could, with the help of others. But what I also liked about this episode was: Good things don’t make everything better. Amy spends a lot of time in the episode trying to be cheerful and helpful and make everything better for Vincent. She brings him large amounts of sunflowers. She and the Doctor bring him into the future, so he can see how much people respect and admire his paintings, and hear someone describe him as the greatest painter of all time. She tries so hard to make it all better for him, so that things are different. So he isn’t sad. So he doesn’t kill himself. But she can’t change what’s already happened. The way I see it, life is a pile of good things and bad things. The good things don’t always soften the bad things, but vice versa the bad things don’t always spoil the good things and make them unimportant. And we definitely added to his pile of good things. Depression, like other mental health conditions, doesn’t magically go away because “things are better now”. It’s something that people live with every day. Those of us with mental health conditions are not going to get magically better, although we may have an easier time or a harder time depending on circumstances. But it doesn’t go away. I really appreciate that Doctor Who said that, so clearly. I hope there is more like this, and soon. I had been waiting to see what you would have to say about Vincent and the Doctor! I am glad to see a writeup that is not only sensitive and thoughtful but also beautifully written. One of my friends was of the opinion that Vincent could see the Krayafis (or however it’s spelled) because he simply saw the world differently from everybody else, as explained with the shift from the “normal” starscape to Starry Night. I do think that whether you go with that or with the “monster that only the crazy person can see”, as you put it, the show still handled it amazingly well. I need to watch the episode again but I’m a bit reluctant because I spent the last, oh, ten minutes of the episode crying uncontrollably. First because Vincent was hearing that he was appreciated, more so than he ever could have imagined, and then because Amy was so sad that she’d lost a friend, and then because – I don’t know that I’ve come across a better description of depression in a mass-media context like this before. I feel like there are a lot of areas where this season has stumbled, but equally there are areas where it is doing a lot of things right, and I appreciate that immensely. I was somewhat more lukewarm about “Vincent and the Doctor,” because, while I liked what the Doctor told Amy about the pile of good things and bad things, and that good things don’t always make it okay, I wish some of the focus had been drawn off Amy. It seemed like Amy had made it her cause to save Vincent from himself, and IMO it seemed to erase his personhood. I wish the Doctor had reminded Amy that Vincent was not her problem to solve. As a long time massive Dr Who fan, this series not being full of Disability Fail has made me very, very happy. A bit you missed about Vincent and the Doctor – they didn’t conflate mental illness and artistic ability. There wasn’t any bits where it was implied that genius = mental, just that he happened both to have an amazing artistic vision, and also to have mental health problems (obviously this is my own interpretation, open to correction!). What the Doctor said to Amy had me in tears. One other thing I liked about it was that he was saying that people with a mental illness are worth engaging, even though it’s not just going to get better. Even if their illness kills them. No, you can’t fix it, there’s no magical cure. But you gave him another good day and that counts. Without it being in that icky condescending way. Vincent and the Doctor meant the world to me, for just the reasons you describe. It felt so true to my own experiences, and having it handled with so much kindness on my show was really great, if occasionally hard, to watch. Also, yes, I was delighted by Eliot – a great child character, and again with the no magical fix. it pleases me also! i have more to say but nothing relevant to this fandom so i believe i shall hie me away to chatterday! I really, really liked Vincent and the Doctor as well and recommended the episode to my brother, who doesn’t watch Doctor Who (depression runs in our family). If I ever meet the distant relative of mine again who teaches courses on mental illness in media at university, I’ll probably recommend it to him (his favourite depiction of mental illness in media so far is “Mr. T and the Women”, most other depictions seem to run along the line of “how not to treat your patients”). I will admit to adoring “Vincent and the Doctor”. I’m depressive myself, and I love that they showed that you can’t just magically fix depression. We were discussing the way Vincent likely would have ended up twisting the whole incident, as well- even if he believed in time travel and didn’t think he’d hallucinated the whole episode as a cruel joke, if his paintings are so important in the future why don’t people like them now? Is it just him? I could really see it not contributing to his final spiral into depression, but certainly being integrated into it. I lovedlovedLOVED “Vincent and the Doctor” – the Doctor’s quote is one of my favorite lines ever. I was already quite happy when Elliot just had dyslexia, the way he had brown hair, but even happier when the Doctor said explicitly that depression isn’t something people make up or can just get over. I had mixed thoughts on Vincent and the Doctor. I thought it was generally well handled, and the Who-fans with depression I know seemed to love the depiction of Vincent. Myself and a few others I know who experience madness elsewhere on the crazy-scale, though… well, I felt like they de-crazied him. I’ve read quite a bit on the life and madness of Van Gogh, not least because of the possibility he was schizophrenic, and I was disappointed to see only symptoms of not-intolerable depression and anxiety depicted. I suppose one can argue that they happened to arrive during a period when he was more functional, and that trying to realistically and sympathetically depict delusional illnesses in a 40 minute sci fi show is a mammoth task… but still. I wanted to see my mad, mad Vincent, and I didn’t feel I did.